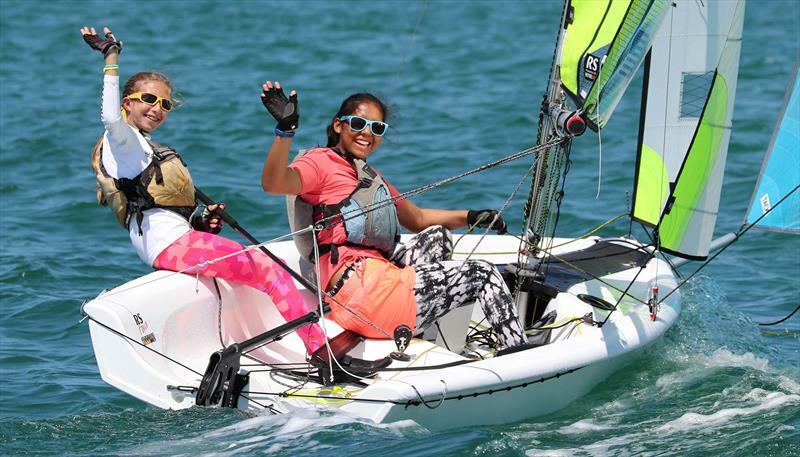 102 young sailors from 11 nations arrived at Clearwater Community Sailing Centre full of expectation on race day 1 of the RS Feva World Championships. Florida delivered beautiful weather with 10-12 knots of breeze, Clearwater added the location (with the best beaches in the US according to TripAdvisor 2018) and the RS Feva class turned up with their buzzing atmosphere. News Channel 8 arrived early at the club with local TV roaming reporter 'Double A' - Antony Allred to check out what was going on. Check out the full article from News Channel 8 here. Day 1 belonged to the birthday boy Dieter and crew Conrad from the USA, who scored an impressive 3,1,1. They were outstanding on the water and the months of hard training this winter had clearly paid off. This was no pushover, the front of the fleet was very competitive with only a few boat lengths separating the top 5 boats in all 3 races on the first day. The fleet was so eager to start the PRO had a tough time getting the fleet away, the black flag had to come out eventually to encourage the sailors to behave. This very committed fleet were not scared off by the black flag which lead to several boats being pinged in the first of many starts for race 3. This lead to many discussions in the dinghy park! Being the PRO is a hard job at a major championship, but for most he did a good job. At the end of day 1, 6 nations were represented in the top 10. This championships in still wide open as many teams have a lot to prove with discards to be included by the end of day 2. As the RS Team left the club in the evening, it was great to see RS Feva sailors from different nationalities hanging out. Some were simply chilling, while the Canadians organised a game of American Football for all to join in.